Add these classic Japanese cartoon characters to the next big birthday party at your house for a wonderful time! Hello Kitty Party Supplies include useful and decorative table items like plates, cups, and napkins, decorations like balloons, banners, and cupcake picks, and fun favors for guests like blowouts, tiaras, and mini buttons. 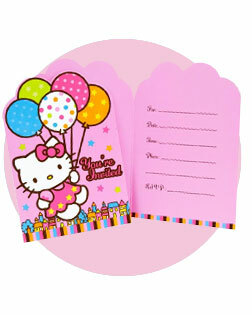 A bright, kind-hearted feline, Hello Kitty is a great friend to have at a birthday party! Hello Kitty is a nickname for Kitty White. She lives in a suburb of London with her father George White, her mother Mary White and her twin sister Mimmy White. Hello Kitty loves baking, music and art. Like all kitties, she is naturally curious about finding and collecting cute things, and our vast selection of adorable Hello Kitty party supplies, activities and costumes make transforming your world into Hello Kitty’s world as easy as pie! From must-have purrrrfectly pretty bows to feline-friendly costumes, the world’s most famous kitty knows just how to sweeten your special day. Kittens love to play and our selection of games and crafts keeps things fun rain or shine. Tiaras and tutus offer a fabulous way for your little felines to get into their favorite Kitty character, so set the stage, get into costume and let the games begin! Spend some quality time with your mini kitty in the kitchen before the party by baking individual cupcakes for the girls on your list. Then, during the party, let them ice and decorate their own cake. Set the stage by adding decorations to your party room. Having fun is always the ultimate goal for every Hello Kitty kitty! Anyone who knows anything about Kitty White knows how much she loves art. Indulge the creative guests at your party and let them use their artistic talents for making Hello Kitty necklaces. They can design them like the necklaces Hello Kitty likes to wear, or they can make up their own. Invite your daughter's friends to join your daughter's birthday party with their favorite feline, Hello Kitty. Use the invitation to set the theme for the party, and remind all the guests that – in true Hello Kitty style – there will be cakes! To enhance the theme even more, encourage the girls to dress up. Bring some glitz to your gala with whimsical Hello Kitty party decorations. Felines and fun go hand in paw, and with so many Hello Kitty decorations to choose from, you can quickly and easily stage your party room for everything kitty. Kitties love confetti, so start by sprinkling a large amount of shimmer throughout your room. Of course the birthday girl will be dressed to impress, and just like her pet kitty, Charmmy Kitty White has a natural curiosity for all things shiny. Be sure to add lots of shiny objects like foil balloons and jewelry to the mix, and don’t forget the tiaras! Sharing the fun is the Hello Kitty way to play, so get things started by filling the air the Hello Kitty Airwalker Balloon. Your group of frisky felines will be romping about this awesome, life-sized Hello Kitty balloon! 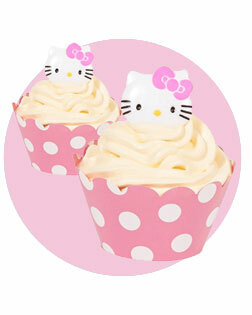 Add some whimsy with Hello Kitty swirls. Hang them from any window, on the wall or from the ceiling for just the right amount of kitty style! They’re easy to hang, can be used indoors or out and are reusable, too. Felines love to get wrapped up in pretty swirls! Create a fun party table with mix-and-match Hello Kitty tableware and napkins. 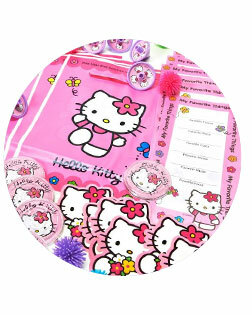 Choose from a spectrum of colorful place settings in solid or Hello Kitty themed designs. Let your guests savor each sip with Hello Kitty cups designed in jewel tones. Keep little paws clean and tidy with Hello Kitty napkins. Let them eat cake served on sweet little dessert plates with cute, colorful utensils. Surprise your guests and give them something to remember by adding a touch of Hello Kitty style in the form of a little goody bag placed at each setting. After all, everyone loves presents! Hello Kitty loves to play and she also loves art. Get a craft session started by offering your guests some simple art supplies, and let each one create their own Hello Kitty mask, collar and tail. Name the cat is another fun game, so divide into teams and see which team can identify the most pictures of famous cats. Hello Kitty character creator lets you draw an original Hello Kitty inspired character. Hello Kitty always makes the best of her situation and you can, too. With these and a host of other options to pick from, you’ll be ready for anything – rain or shine! Sweet inside and out, this Hello Kitty bag of goodies is just waiting to be discovered. Laughs will fill the room as your little felines try to break open the piñata. If this is too difficult for your kittens to do, just pull each string to reveal the treats inside! Every kitty worth her weight in jewelry knows getting into the right outfit makes all the difference. This charming Hello Kitty Tiara is just the ticket to instantly transport you to Kitty's world. More is never enough when it comes to party favors, and Kitty White loves to share her stuff. When she was first introduced in 1974, Hello Kitty was known as the little white kitten with no name. Since then she has become a well-known icon and is loved around the world. Stock up on everything Kitty with this large selection of fun, Kitty party favors. Choose from an array of iconic Hello Kitty options including stickers, bubble wands, jump ropes and lots of other accessories and toys. You can never have too many party favors, according to Hello Kitty! Dish out lots of fun treats for your guests with this Hello Kitty mega value pack. Filled with an assortment of everything Hello Kitty, all your favorite little felines will go home with their own keepsakes from a day full of memories that will live on forever! Hello Kitty wants to be sure you have something sweet to remember her by until the next time you get together. These adorable cupcake wrapper and pick kits are a great addition to your already-fabulous goody bags. Guests will bid you adieu and remember a day filled with whimsy, charm and, of course, plenty of treats!